This Battersea pub’s name comes from its location on land which formerly belonged to the manor of Battersea. Located at 2 St John’s Hill (on the corner with Falcon Road, close to Clapham Junction train station), the manor was, from the 17th century, in the possession of the St John family (hence the name of the street in which it’s located). The family crest of the St Johns features a falcon, and so we have The Falcon pub (and, of course, Falcon Road). 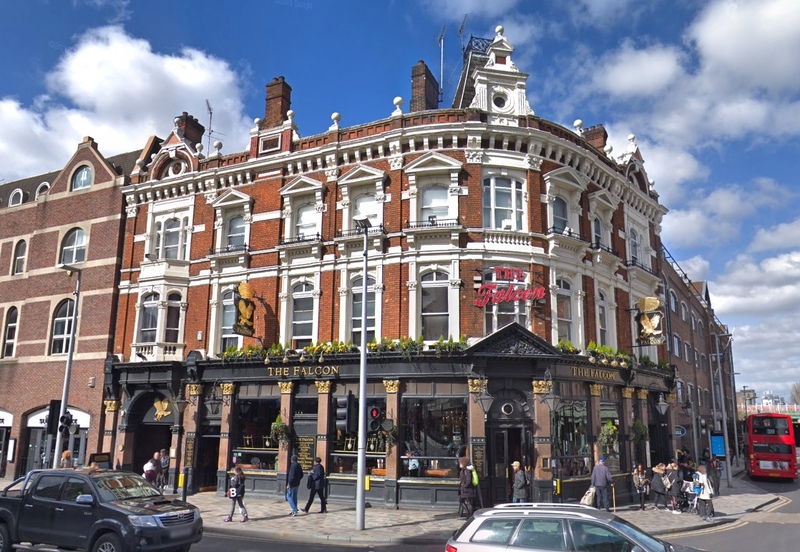 A pub has been located at the site for centuries (at least since 1733) but the current Grade II-listed red brick building dates from the 1896 when it was constructed as a purpose-built hotel (with a billiard room added to the rear a few years later). Interestingly, the pub, which has a 360 degree bar apparently partly designed by renowned Dutch artist MC Escher, once held the Guinness World Record for having the longest pub counter in England. Other interior features include a stained glass window featuring a falcon from the St John family crest. 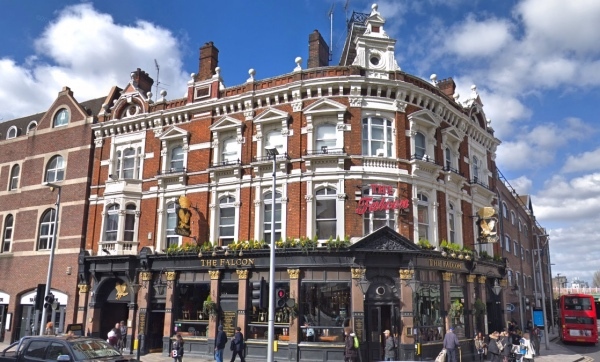 It’s not the only pub named The Falcon in the area – there’s another (this one’s bright yellow) pub at Clapham North with the same name.